Road Rash is motorcycle racing game developed by Electronic Arts for the Windows 95. The Road Rash game features 5 stages or levels namely The City, The Peninsula, Napa Valley, Sierra Nevada and The Pacific Highway. In the demo version of Road Rash there is only one stage which is The Peninsula. The Road Rash game is completely not supported on Windows 7 64 bit, because the game is too old to be run on newer Windows OS like windows 7, windows 8 and windows 8.1. 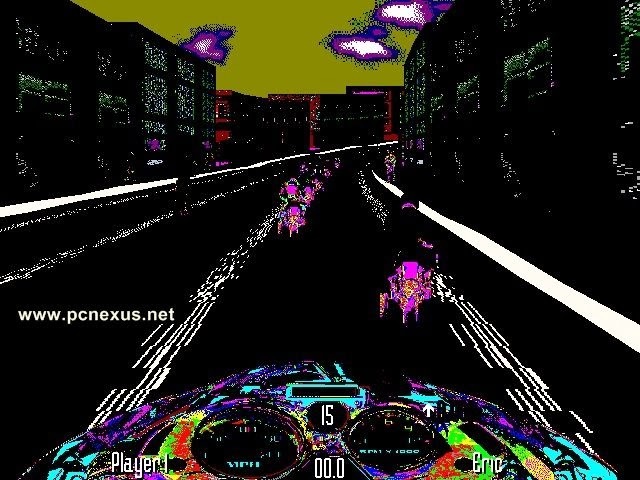 When this game is run on these Windows OS then we will get a Road Rash color problem in which everything looks like a 16 bit bitmap image in which game graphics are not visible, instead we see some random colors on screen while playing Road Rash. 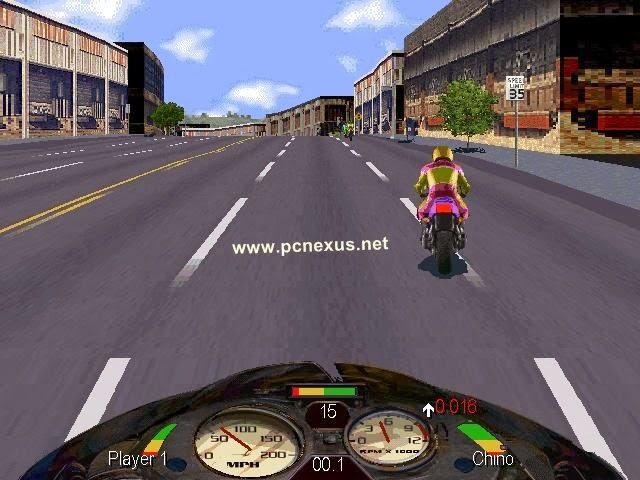 Road Rash can be played on Windows 7 & Windows 8 64 bit with Road Rash color fix file. In this tutorial I will teach you how you can play Road Rash (1995) on Windows 7 64 bit and Windows 8. Before playing the game you have to create a color fix file and place it in the game folder. To create the file follow the steps. Copy the following code and paste it in notepad. Now save the file as ROADRASH.bat. Its done, now paste this file in the RoadRash game folder. Download Road Rash for windows 7 64 bit full version. You have created RoadRash color fix file above. Place this file in the game folder and open it. The game will run without graphics problem. Extract the file. In the game folder you will find two files named as 'ROADRASH'. One of them is the .exe file and other one is .bat file. Double click to open the 'Roadrash' registry file and add Roadrash entries in the Windows registry. If you do not perform this step then you will get an error 'You need to install the before you can play it'. Now open 'ROADRASH.bat' and start playing the game. See the image below. Note : If you open the ROADRASH.exe a file with a biker icon then you will get color and resolution problem. Run the game through bat file only to avoid color problem. Note: RoadRash 95 also works without any color problem on Windows 10 even if we don't use the color fix file. The only problem is that there would be no background music. The game will show 'MIDI error' on launch. In Road Rash game we get color problem because of the Windows 7 'explorer.exe' file. The color fix file when executed terminates this explorer.exe and starts the game. When game is closed the explorer.exe process is started again. The explorer.exe process gives color problem in Road Rash in Windows 7. When this process is terminated we do not any color problems. You can play this game on your android phone or tablet. To play this game on android, read this article. If you like the tutorial please share it. It says i need to install the game before running it..! double click on regedit file, and enable compatibility mode in application settings, then launch roadrash.bat. If you feel any problem, tell me again. Hey I ran it in the compatibility mode and double clicked the registry file. Its still having the same problem as above. What to do? do you have a cd rom drive on your pc. The same problem. I do not have one. Same problem, registry change didn't help. I do not have cd-rom if this is important in some way..
yes cd rom is necessary. If you don't have it then use daemon tools to install a virtual cd rom on your pc. Then roadrash will work. hi abishek, i've benn following your tutorial on how to play this game but i still cant play this game. yes i've installed daemon tools and ran it in comp mode. just to be clear, i selected the comp mode on windows '95. but it still says i need to install the game. there is a 'Regedit' file in the roadrash folder. Double click it to add the roadrash entry in the Windows registry, then you won won't get error like 'you need to install the game before playing'. Then after doing this double click 'Roadrash.bat' to play the game. Do tell me if it works. sadly it's not working, but i do appreciate the help. maybe i'll just give upon this, but still it bugs me, i've followed the tutorial thoroughly but still not succeed. ugh, what is wrong with my laptop. OK give me some time I will come up with a solution. Negara, I have updated the download link with roadrash installer. Now download the exe file, install it and enjoy the game..
Its good to hear that its now working for you. Thumbs up for u Bro- Really i was fed-up after searching a lot of pages- finally i got the solution. Thank You its good to hear that it worked for you. if you liked the article please share it. Download the installer and install the road rash game first before playing. Installed the game, put in the bat file, ran the reg file, no luck. Tried running the bat in Win98 compatibility, tried setting the exe in compatibility then running the bat, still nothing. What error are you getting? The tutorial is working on Windows 7 as you read the comments of others saying that they have installed the Road Rash game and playing it. What is the error message, tell me I will try to help you. You are running the game in Windows 98 compatibility mode. I think this is the reason why your roadrash is not running. Disable the windows 98 compatibility mode then again run it. If still not working then set the compatibility mode to windows vista or windows 7, but first disable compatibility mode and check whether game is running. If the game is still not running then your graphics card may be not supporting the roadrash game. What's your PC' graphics card. Is it Nvidia or AMD. I can't download road rash game file from the link provided above. When I click on the link there's no option of downloading it. I have downloaded the color fix file. Click the link. Then after loading it press 'CTRL+S' to download the file. You have to launch Roadrash.bat not Roadrash.exe. If it doesn't help then do the following. 1. Open the roadrash folder and press shift then right click then choose 'Open command window here'. 2. Then type this following command. The press enter. Game will run perfectly. Hi again, i made a small video could pls tell me what i did wrong thank you. I have watched the video. Which version of windows you are using. Seems like that your graphics card is not supporting roadrash 95. I have tested this tutorial on my notebook and its running without any problem on windows 7 64 bit. you can talk to me at 'facebook.com/pcnexus1' or join me on Google+. Here is a final solution. 1. Open task manager and click the 'Processes' tab. 2. Here find 'explorer.exe'. Click on it and then click 'End process'. 3. Now click "File>New Task(Run...). 4. Click browse and locate the 'ROADRASH.exe' file. Do not use the .bat file. Click 'OK' to run the game. 5. After exiting the game click 'New Task'. Type 'explorer' to get back windows explorer. Either the 'explorer.exe' process is still running or your graphics card has issues with Roadrash. explorer exe isnt running for sure, its graphic card probably. My graphic card is ATI Radeon (TM) HD 6470M if it helps. Try running the game with integrated graphics. Your graphics card may have issues. It will work on integrated motherboard graphics or Intel HD graphics. The music and videos do not work, I was hoping someone would have a fix? What is your PC hardware configuration. Have you checked your video card. Nvidia, AMD cards are not supported. the link to the color fix file seems to be broken. But the game doesn't let me save! How do I fix that? Check game settings for this. Are you sure the file was *this* small ? I came across some files as large as 400mb+ So what's the deal here ? Extreme compression ? Does this contain music, cut-scenes & everything that the original CD had ? I've yet to try this. I've begun downloading. I'll check back if i run into some problem. BTW Thanks for putting together such a simple guide. This is only game with music. It doesn't have cut scenes. I can't believe the timing. I was done with the installation and just about to download the colour fix when I stumbled upon a broken link. The link for the colour fix is broken, mate. Check that. Meanwhile, I'll try Googling it. Updated the tutorial please check. Read it completely. Can it be played in Windows 7 - 32 bit? When I try to run the game it tells me it can not find primary language file and closes. I installed everything using the .exe file and followed the instructions for the .bat file. Any advice? Thanks, Is there anything more we can help.. Install the game first and then double click the registry file in the game folder. The game should run. You need to install the game first. I have tested this and it is working. If you are still getting this error then please scan your system registry with CCleaner and remove unused entries. Hope it helps. Have you installed the game, followed all my steps? If it is still not working then there might be a graphics card issue or some compatibility issues. Wait for 2-3 days I will upload a video on youtube showing how to play this game. I will update you with the link. You can join me on YouTube. It may not be compatible in windows 10. Install the game, no need of cdrom. Also double click the registry file. Both commands are working fine. You can check it yourself. Go to command prompt and reduce the directory to C:\ by using cd.. command. Then either type 'start explorer.exe' or 'start C:\Windows\explorer.exe'. You will get the same result. I haven't tested this game on Windows 10 yet. Any error that you are getting? Wait, I'll post a video tutorial within two days that will clear all your doubts. Please go to this link and watch the video tutorial. Newer computers may not support this game. Thanks, and enjoy the game..
Road rash.exe has stopped working. On win 10 64 bit. Tried everything as u said. No hope. Haven't tested the game yet on Windows 10. RoadRash is a very old game it may not support the Windows 10 environment. You can play it on android though. Read below. What error are you getting on opening the regedit file in the roadrash folder. Game work without regedit entry in most cases. hi abhishek, tried everything - .bat file and all, but the colour problem is still persisting..bro pls help !! Which version of windows you are running. This is not tested by me on Windows 10. First open task manager and stop the 'explorer.exe' process. Then run the game as new task with correct location. I hope it will work. Please check the video in the tutorial given above. 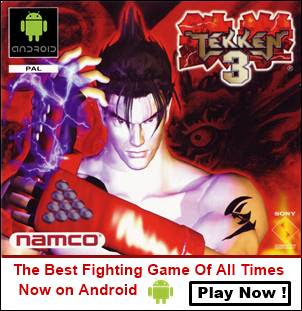 You can also play this game on android. Link given in the post. If nothing works then reply to this thread and I will try to troubleshoot the problem. why video is not playing after winning??? PC version doesn't have videos. Please play the road rash android game for full videos. Read the tutorial below. The game link that I have given in this post also works on 32-bit Windows 7. I will try to find a fix for this and will let you know.